fiddleheads, one of the many signs new englanders look for, signaling spring is officially here and summer's on its way. a fiddlehead, for those of you who have no idea what i am referring too, is a unfurled baby ostrich fern. when soaked, and lightly cooked they are amazing and the time to enjoy fiddleheads, sadly only lasts a few short weeks. this past week fiddleheads popped up at one of my favorite places - picnic rock farm; they are officially open for the season! i helped myself to a big bag of fiddleheads & a heady bulb of garlic. 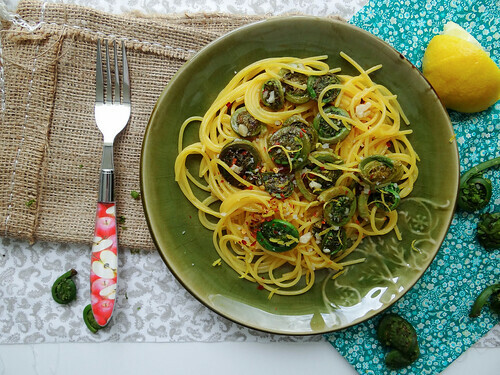 fiddleheads are best enjoyed with only a few enhancements, my personal favorite - lemon, garlic and crushed red pepper with a pinch of salt. a little butter and olive give the sauce body. 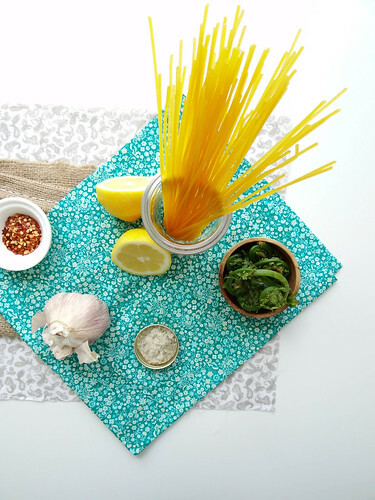 tossed with quinoa pasta is the making of a wonderful, fresh, locally foraged meal. the prep of the fiddleheads is absolutely crucial - not blanched long enough, leads to a bitter fiddlehead. sauteed to long and you end up with a mealy fiddlehead. 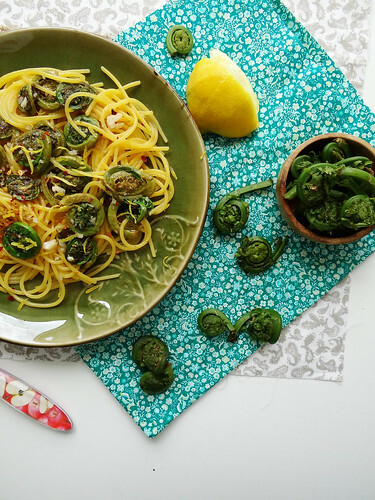 treat your fiddleheads with love and patience and in turn they will give you the flavors of spring all in one amazing complex bite. fiddleheads should be soaked in a bowl of water, stirred around a bit - loosening any dirt that may be hiding between the fronds. soak much like you would leafy greens, by filling a big bowl of water and allowing the dirt to settle to the bottom. before adding the rinsed fiddleheads make sure to trim away any brown spots. the fiddleheads are blanched in boiling water, then submerged in a cold water bathe. 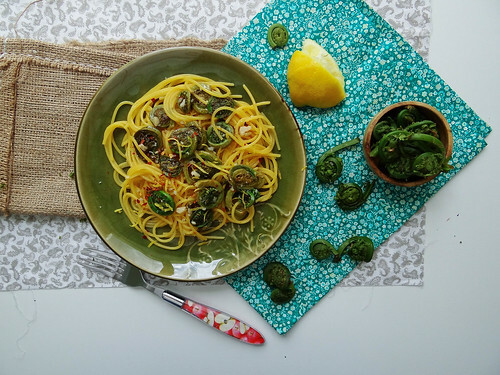 the blanched fiddleheads are sauteed with a good amount of fresh garlic, olive oil, vegan butter and crushed red pepper. towards the very end a squeeze of fresh lemon juice is added with a healthy dose of salt brightening and melding all the flavors. lemon zest is added to the final dish - for a bit more heat sprinkle a pinch of crushed red pepper over the top. for me this is the best way to enjoy springtime fiddleheads. there is something so special about enjoying a dish made from locally foraged greens - or rather baby ferns. 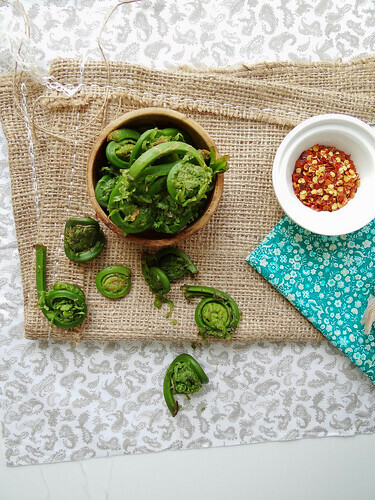 a welcome sign of spring, fiddleheads are the gateway of local goodness leading us into summer. 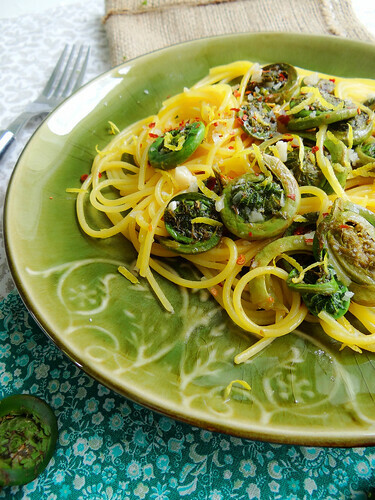 if you don't have access to fiddleheads, asparagus would be a very nice substitute. trim any brown spots from the fiddleheads, fill a large bowl with cold water and submerge fiddle heads, swirling the fiddleheads around a bit. 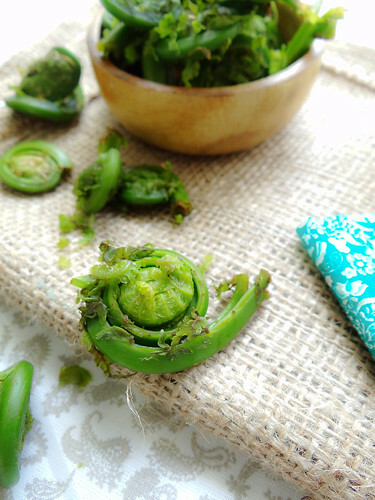 allow fiddleheads to soak for about 10 minutes. in a medium sauce pan, bring 5 cups of water to a boil - add fiddleheads (carefully transferring from soaking bath to avoid stirring up the sentiment at the bottom of the bowl) boil for 5 minutes. while fiddleheads are boiling, rinse out the soaking bowl, fill with cold water and add 5 ice cubes. with a slotted spoon transfer the blanched fiddleheads to the ice water bathe. The fiddlehead water in the sauce pan will be brownish black, change water out and bring to a boil for pasta. cook pasta according to directions. in a medium saute pan over medium-high heat melt vegan butter and olive oil - add fiddleheads, garlic and crushed red pepper. saute for 3-5 minutes, testing taste and texture about halfway through cooking. at the half way point add fresh lemon juice. add the cooked pasta to the saute pan with 2tbsp pasta water tossing to coat pasta with the fiddlheads. plate & sprinkle with a generous amount of good coarse salt, lemon zest and crushed red pepper. and let us not forget the Versatile Blogger Award! My good friend Willow over at "Will Cook for Friends" has passed along this great award. Willow's & her Blog are both amazing. I have loved getting to know her over the past 6 or so months and I encourage you, if you haven't already to go and check out her super blog. The Inventive Vegetarian - Elana's Blog is so much fun and one of the first blogs I started to follow. She has some great and easy recipe ideas for those looking for quick and easy. Coconuts and Cardamom: Andrea and Tawny have an amazing Blog- I just recently started following and I tell you, it was love at first read. Like me, I am sure you will be hooked after just one visit! The Veggie Nook: Gabby has received a few of these awards but I just had to include her in on my list - she is an absolute sweetheart and her Raw & Vegan Recipe are absolutely amazing! That was Vegan: Barb is hilarious - between her battles with enormous flying bugs and her amazing recipes, That was Vegan is always a fun experience. 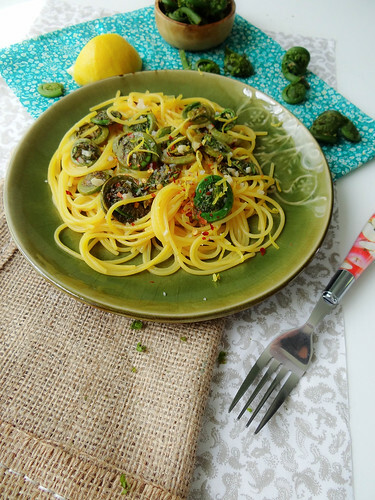 That pasta dish is beautifully simple and really lets the flavours of spring shine. So lovely! This coming from one of the other sweetest people in the world! You so deserve this Gabby, I love your Blog! and I completely agree about hiking! I LOVE reading about your dinner parties, so much thought and time goes into those, I can tell! 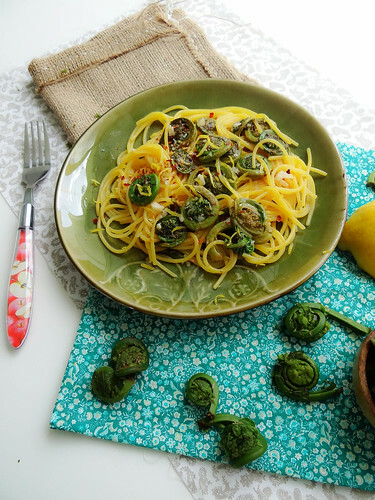 I tried fiddleheads last summer and loved them! This seems like the perfect way to prepare them...too bad they only seem to be available for a short time. I actually saw fiddlehead ferns growing in the rainforest when I visited Australia and the plants looked so neat! I have yet to try fiddleheads, but they just looks so fun. I'm going to look for them and try your delicious looking recipe! They are super fun and so delish when simply prepared - they taste like spring! Oh wow! The colors of this dish are so beautiful! And it looks super yummy and satisfying! I need to go find some fiddleheads now, before the short season is over! Thanks Richa! They do kinda look like curled up catapillars don't they? I bet if you give them a try you just might love them! haha that is so funny a Warrior, I can only imagine what he was dreaming about. I can't say I've ever had fiddle heads but they look like so much fun! Thank you so much for the nomination! I really enjoyed reading all about you. One of my childhood friends is also a full on sleep talker. It always made sleepovers more interesting. I can't wait to read more about you Elana! My grandparents used to gather these every spring and I can't say I would have ever known what to do with them- but this looks fun! Nice! I'm so jealous of those fiddleheads, since there definitely aren't any in CA. I guess I'll have to try this combination with asparagus instead! I heard that some whole foods out in Cali have or had the Fiddleheads, they were like $19.00 a pound which is just craziness considering we can walk out in our backyrads here in NE and forage them at no cost at all - let me know how this turns out with asparagus, I would love to know! Confession: I've never had fiddleheads. I've seen them before, but until now I didn't fully understand what they were. I'm not sure I've ever seen them around here, but I'll keep my eye out at the Farmer's Market anyway... they sound delicious, espeicially in this dish! My cousin and I would also have full on conversations with each other in our sleep - while we were sleeping over our Aunts House, she came in to tell us to stop chatting it was time to go to sleep and we were both in a super deep sleep talking to each other - she was a bit creeped out! I love fiddleheads, but I've never had the opportunity to cook with them before. Thanks for these helpful tips! You are so welcome Matt, I am glad that you liked the dish! i've only had fiddleheads once from a vegan restaurant. i really loved them, but i can't find them anywhere to purchase. this pasta dish looks deeeeeeeeeeelicious! what a lovely dish and i love the name! The name is great isn't it! They still offer it but changed it from fiddleheads to asparagus served with toasted pita points! Thank you Heather for nominating Tawny and I! Consider us completely tickled! We are so touched!! I shot you an email with all of the fields filled out. I am not too sure where I was suppose to send it? Just let me know. p.s. 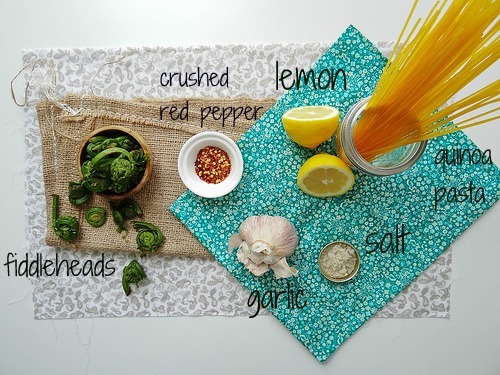 this pasta dish is so fun! I guess anything with the name fiddlehead's would bring a smile to someones face! I have never heard of fiddlehead's but you have definitely convinced me to try them! You and Tawny totally deserve that award :) Typically you would add the info to an upcoming post on your blog and select 5 or more blogs that you would like to pass the award on too. I've never tried Fiddleheads but have always wondered what they taste like! Will look out for them next time I'm at the grocery store (I think they sell them at Whole Foods). 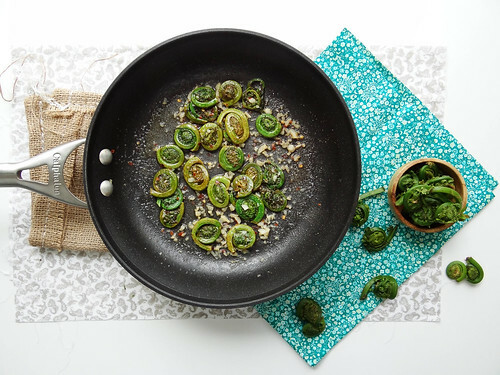 I have heard some Whole Foods carry Fiddleheads, I hope you get the chance to try them! You are so awesome, thank you for featuring this on your Blog! I was all set to pin this then I thought: I'll never be able to find fiddleheads. Wouldn't you know that at Whole Foods today, I saw them! Woohoo, this recipe is now pinned!